This is the easiest and most delicious Chinese dish ever. 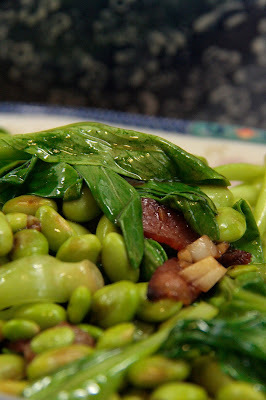 I learned to make it from the Shanghainese ayi who cooks lunch very day for the office downstairs. I don't speak any Shanghainese mind you (it's as different from Mandarin as Spanish is from English) but I just perch near the wok and watch the action. She chatters away, I nod. She asks me a question, I nod and shake my head in alternating order. She thinks I'm a complete idiot but I don't care, she's a really good cook. I'm learning a lot. It doesn't look completely exciting but the rich umami flavours of the soy beans and the salty ham in this dish make it very, very more-ish and completely satisfying. There are never, ever leftovers. I've given it to kids and who won't eat green vegetables and they practically lick the bowl clean, and when the ayi makes it for the office guys it's the first dish to be emptied. First shell the soybeans. This is the only difficult part of the dish, because the little buggers have a very tough hairy skin that doesn't give way easily. 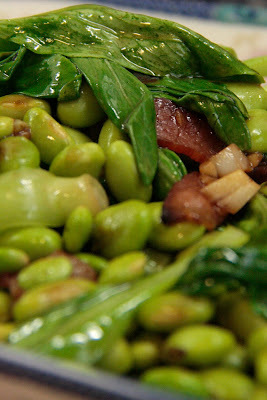 Give the shelled beans a good wash and remove all the little white bits attached to the ends of the beans. 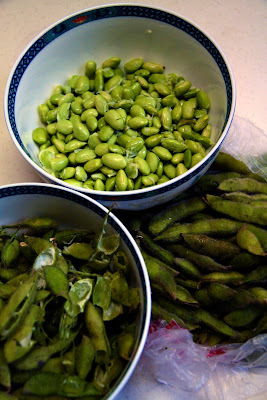 Now steam or boil the soy beans for five minutes (to soften them). Blanch. 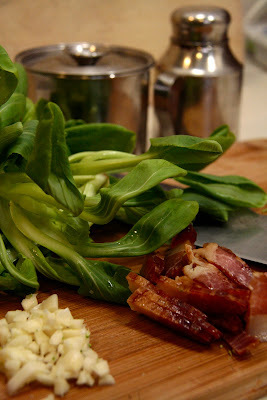 Dice the garlic, slice the ham, and wash the bok choy. 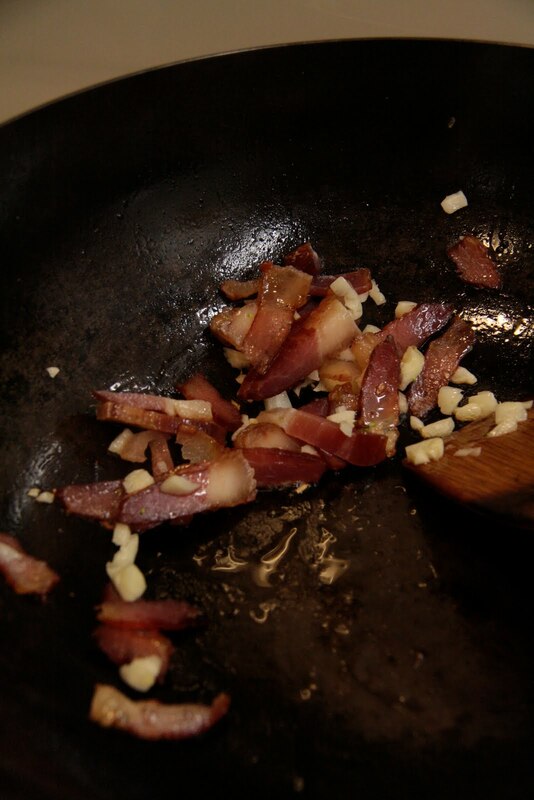 In a hot wok, stir fry the garlic and ham in a splash of oil. 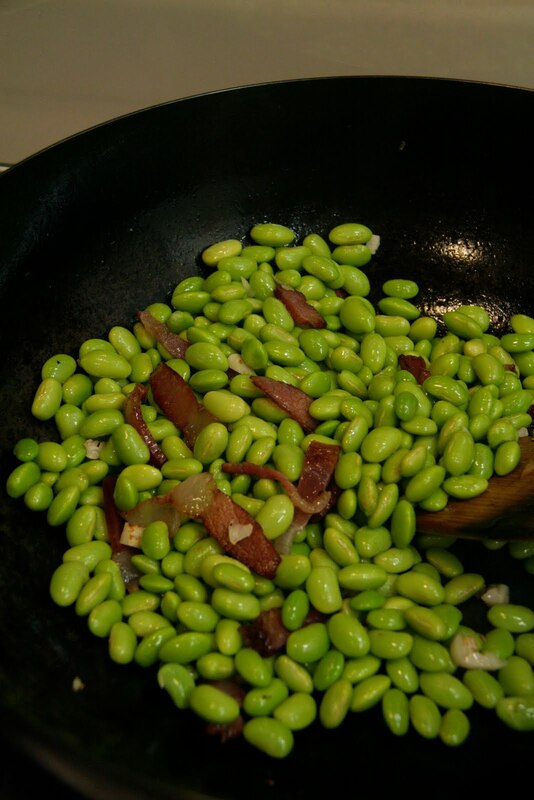 As soon as the garlic and ham brown, add the part-cooked soybeans, cook for a further two minutes. Add the bok choy and at the same time half a tablespoon of oyster sauce. 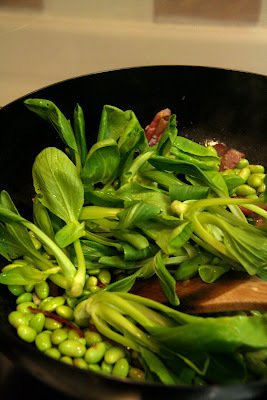 Stir to combine and cook for 1 minute, until the bok choy looks wilted.